I made us one of those annoying trendy salads that has vitamins and stuff. Then I served it to totes meat + potato loving friends, and they devoured it. So, it was a success. I made this last night (please be impressed at this fast turnaround) for our bff’s Wes and Sangeeta along with some pasta that I’ll show you later. Jay and Wes had been golfing all day (and drinking…..lots of drinking…. ), so I used the afternoon to test some new recipes. This one turned out REALLY well. 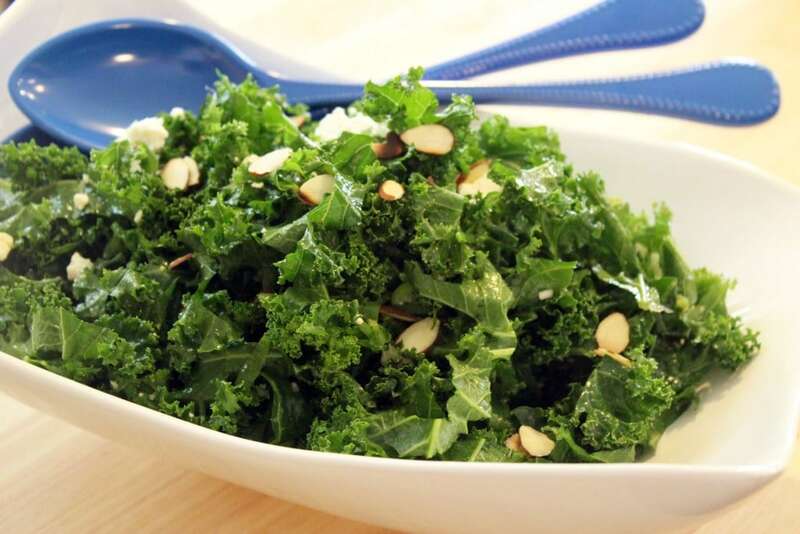 I’d seen raw kale salads in magazines and online, but was sort of wary because…kale isn’t like lettuce? I was worried it would be tough or woody or something. But REALLY, it wasn’t. 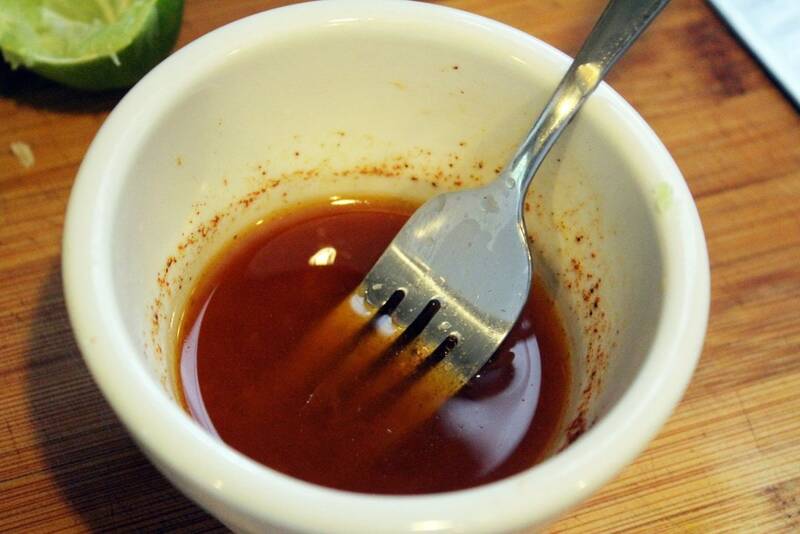 The dressing for this is great too – it doesn’t taste Mexican at all, so don’t worry about that. It just tastes REALLY flavorful. I’m going to stop writing REALLY in all caps now. So, for 4 people plus leftovers, 1 bunch of kale was more than enough. 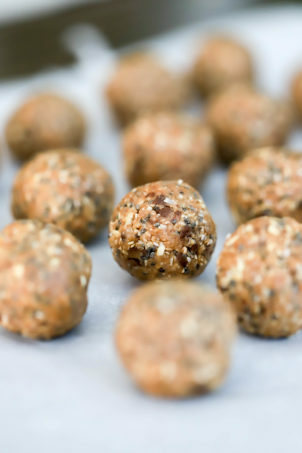 You also need a lime, olive oil, chili powder, salt, almonds, a scallion, and feta cheese. I think ricotta salata would be REALLY good (omg I can’t stop), but I couldn’t find any at the store yesterday. I’ve moved on. First, let’s wash the kale so it has time to dry. Remove the stems by curling your fingers around the leaves and using the other hand to pull the stem away. Then, wash the kale leaves really well. Gritty greens are kind of….off-putting, so this isn’t the time to be in a rush. Let the kale dry on a kitchen towel. ….then drizzle in the olive oil and add a sprinkle of salt. 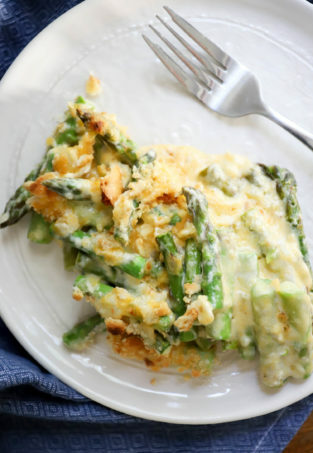 Whisk the dressing with a fork, and taste it! Add more salt if you need, and if you like things way tangy you can use another lime, some vinegar, or even lemon juice to up the acid factor in the salad. Now, the kale should be sort of dry. 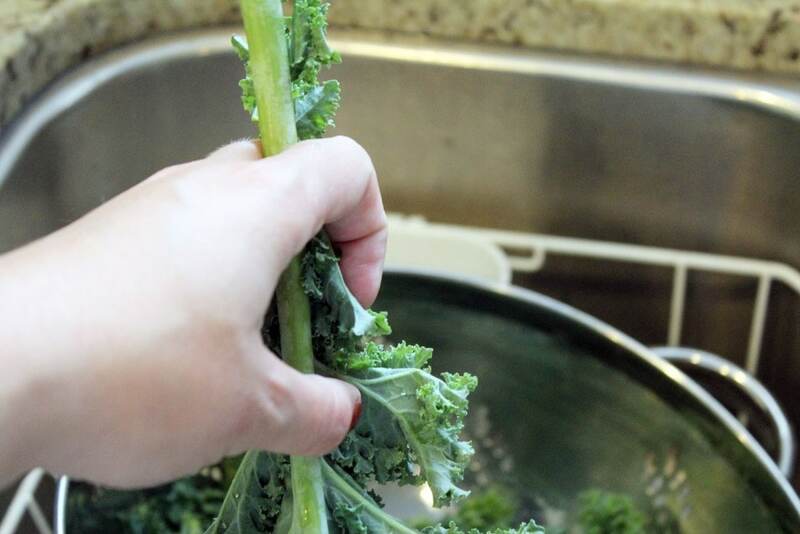 Pat it to get as much water as you can off with a kitchen towel, then thinly slice the kale – 1/2 inch or so thick. I did this by rolling a few leaves at a time into a tight bundle and then slicing the kale. Sweet! 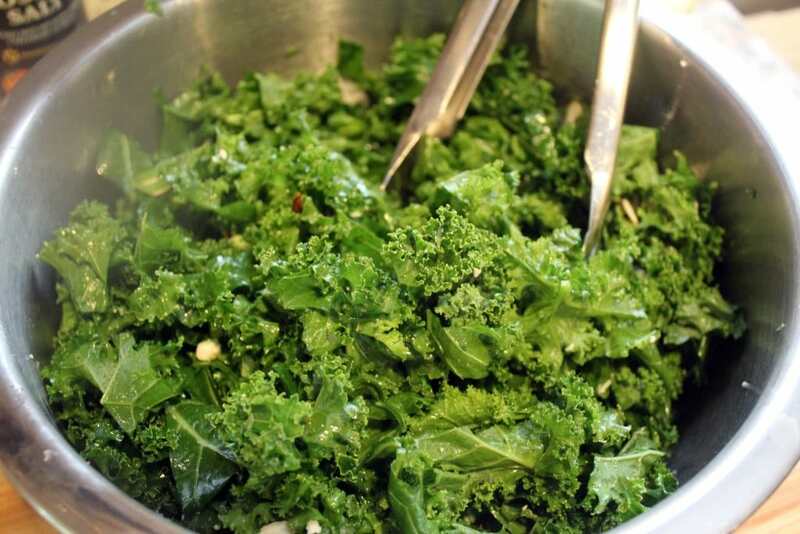 Add the kale to a large bowl, then drizzle the dressing all over it. This will coat the leaves, but not be soupy like some salads. 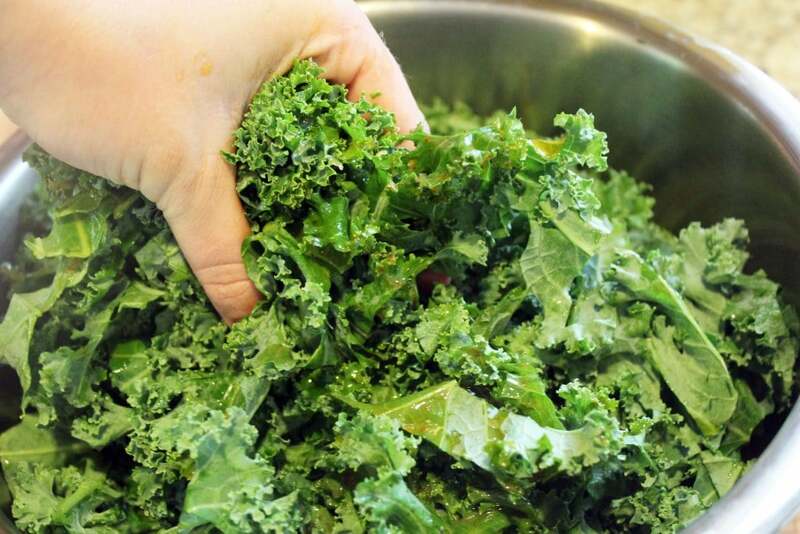 Using your hands, mix the dressing all over the kale for a minute or two. 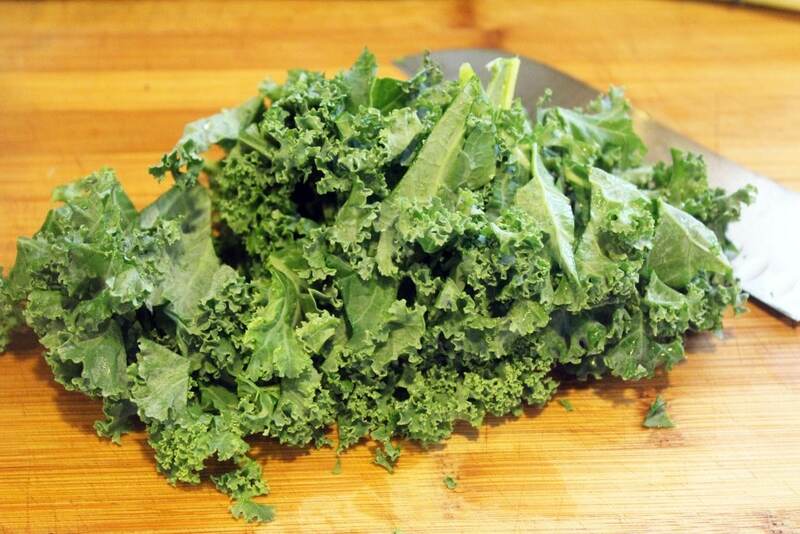 This is what helps the kale tenderize – using actual physical force to start to break down the cells. The great thing about this salad is that it won’t wilt even if you make it a few hours in advance – the acid in the dressing will just keep tenderizing the kale. We want the kale to rest for at least ten minutes, but you can let it stand for several hours or even overnight if you aren’t ready to serve it yet. 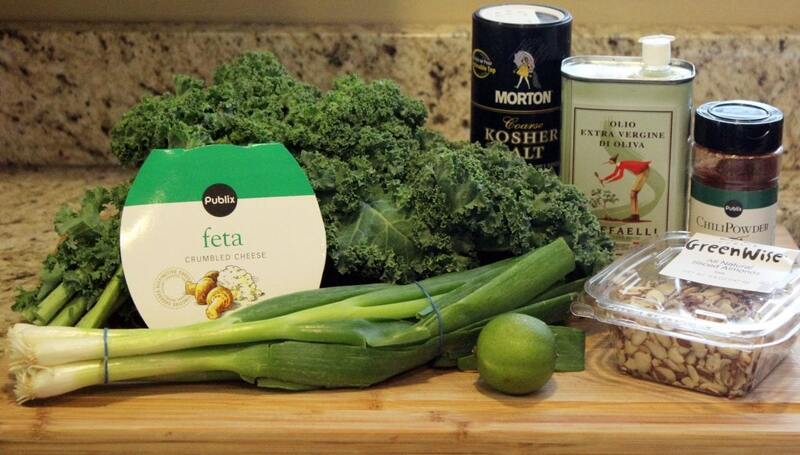 While the kale rests, let’s prep the rest of the ingredients! 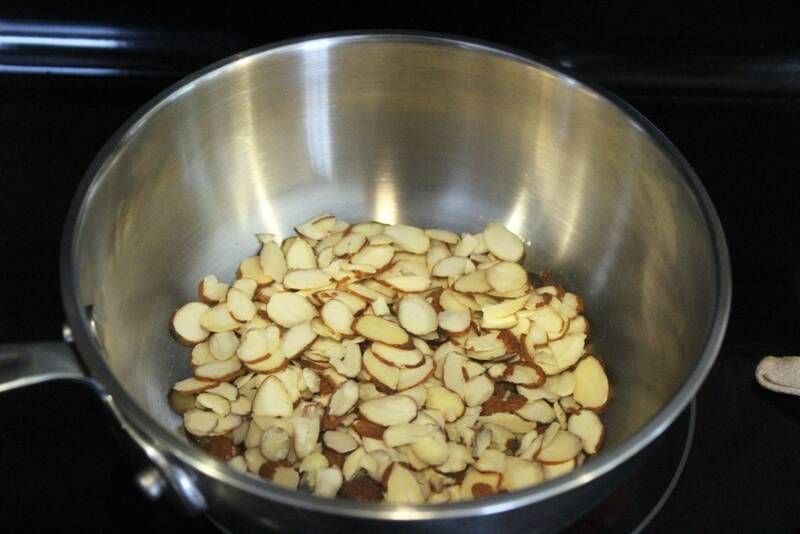 In a small dry skillet, add the almonds over medium heat. 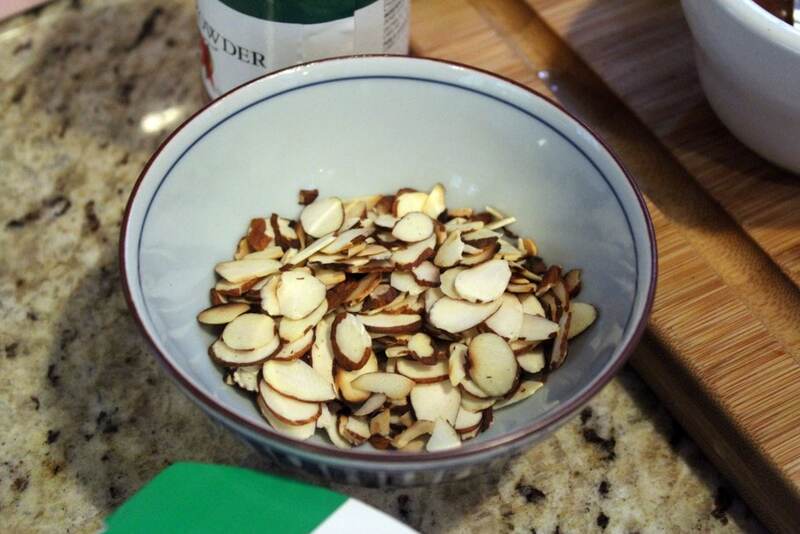 Let the almonds toast for just a few minutes, shaking them often, until they’re golden brown. Then set them aside. 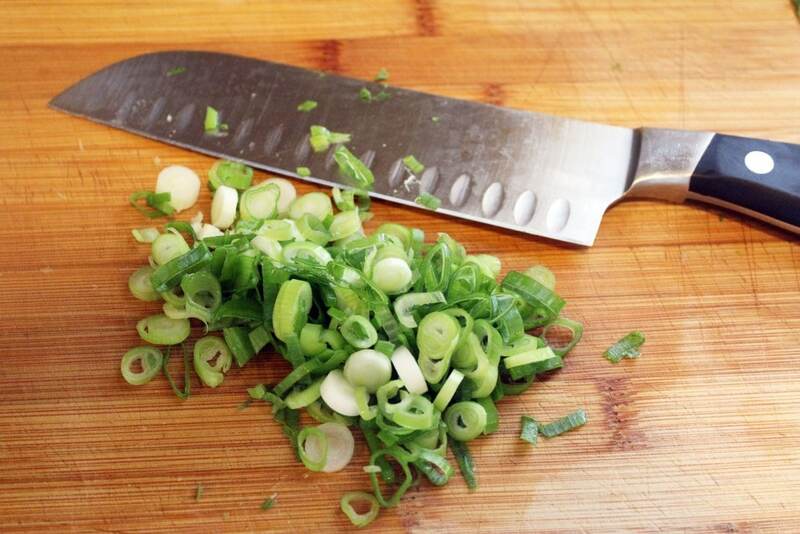 Thinly slice the scallion, too. When you’re ready to serve, add most of the scallion, feta, and almonds to the salad. 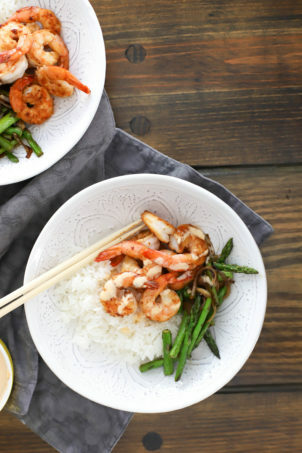 Use tongs to toss everything together! 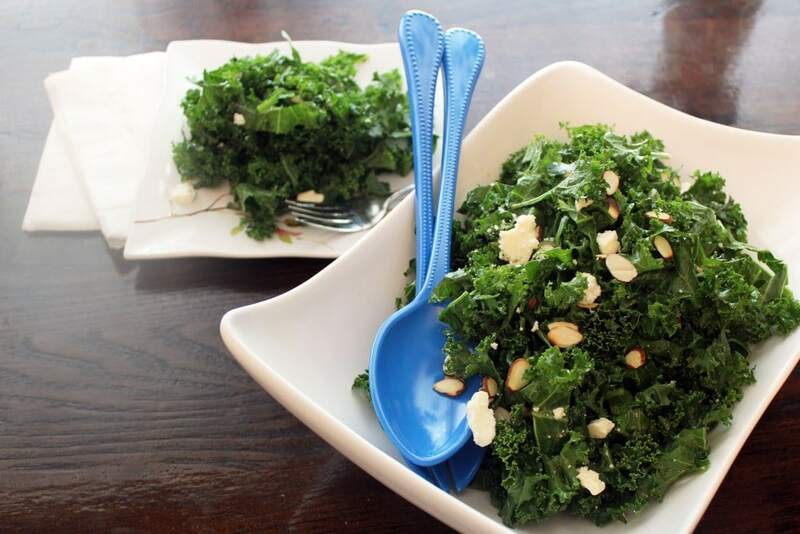 Taste the kale – I sprinkled a little extra salt on the salad at this point. Top the salad with the rest of the almonds/feta/scallion, and there you have it! 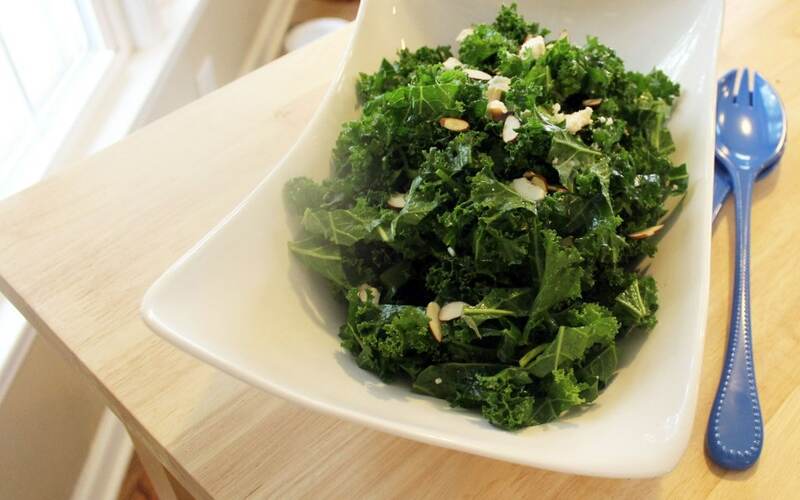 Really lovely kale salad with huge flavor and tons of health benefits. 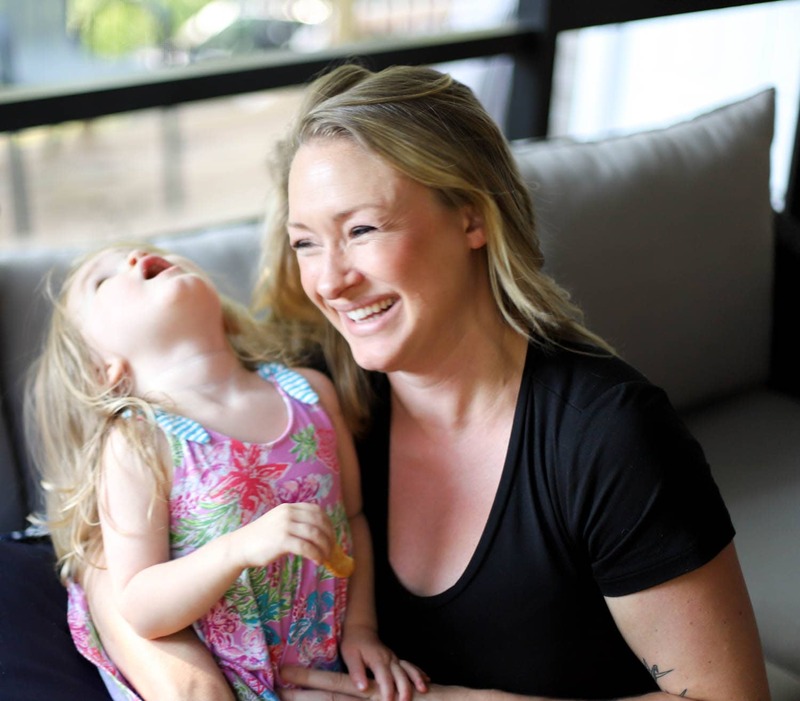 We loved this, and I hope you will too. It was great with pasta, but I think with some buttered bread and (on a weekend) a glass of wine it’d make a really nice lunch too. 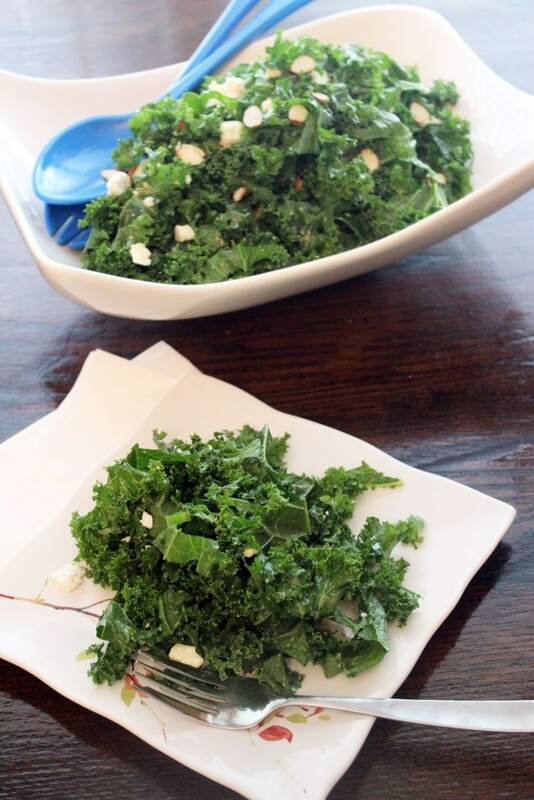 The kale is heartier than just lettuce, and the scallions and feta add a nice sharpness. Enjoy this friends! We’ll be repeating it again and again! Shared with my Weekend Potluck gals. YUM! Strip the stems from the kale and wash it well. Set the kale on a kitchen towel to dry. Meanwhile, make the dressing. 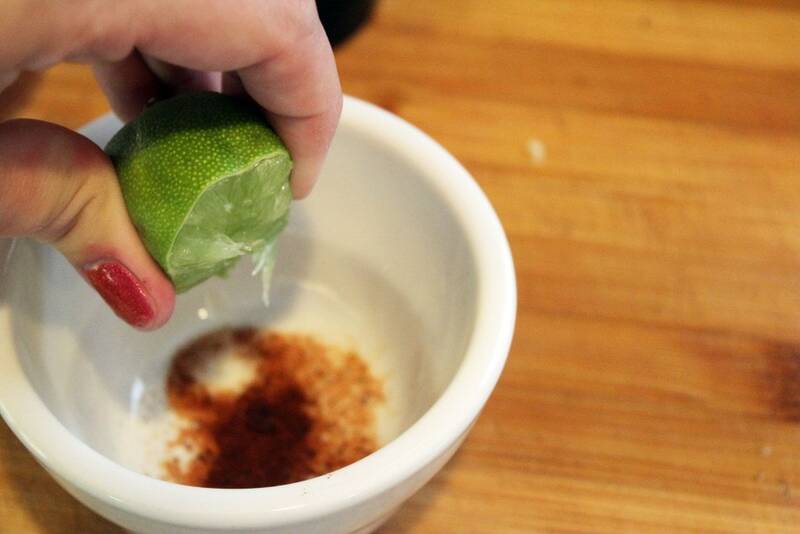 Combine the lime juice, chili powder, olive oil, and salt in a small dish. Whisk together and taste - add more salt if you'd like. Working in batches, thinly slice the kale into 1/2 inch or so strips. Add the kale and the dressing to a large bowl. 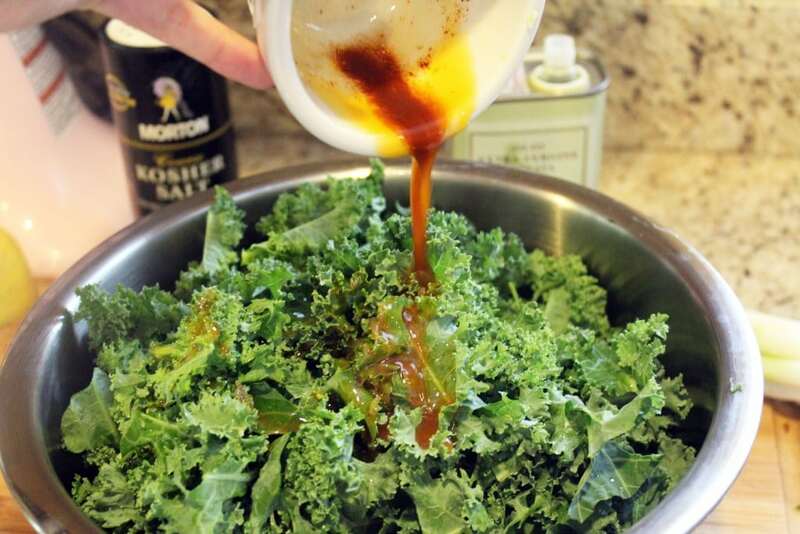 Using your hands, mix the dressing well into all the kale, rubbing the dressing into the leaves as you go. 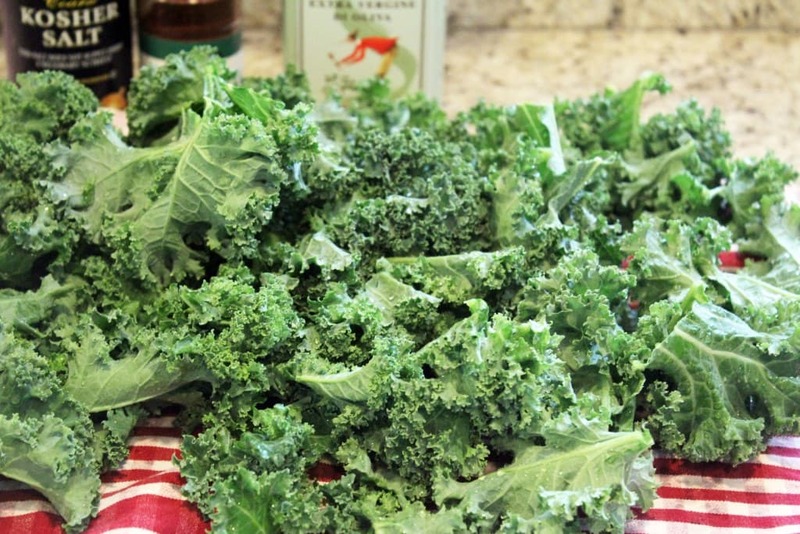 Let the kale sit for 10 minutes (or several hours if you have time) to soften and absorb some of the dressing. 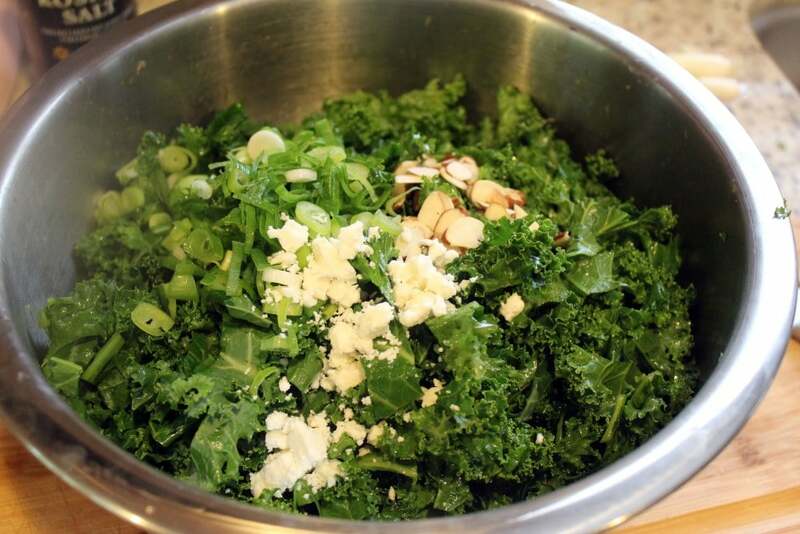 When ready to serve, add most of the scallion, feta, and almonds to the kale. Toss to combine, and taste. Sprinkle some salt over the salad if you'd like. 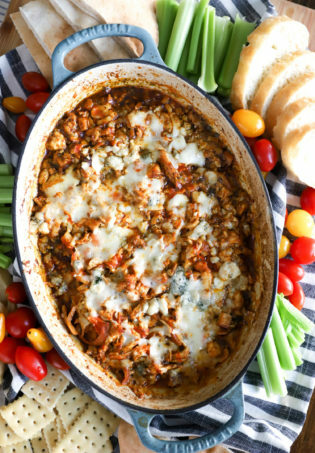 Serve with any additional feta, scallions, and almonds. Enjoy! 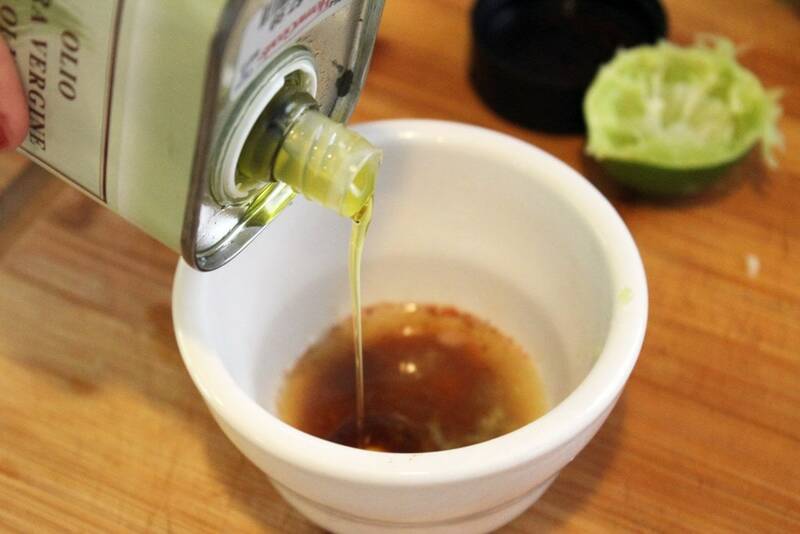 If you like more acidic dressing, you can add more lime juice, vinegar, or lemon juice to the dressing - add 1 tablespoon at a time and work your way up. I wanted to drop you a line and tell you that I made this tonight and it was very good, so, thanks! I happened to have pecans on hand and toasted those instead of almonds, and they were really tasty as well. I’m printing this recipe for future reference when we’re overrun by kale in our garden! Thanks, I’m so glad you liked it! I love some raw kale, and totally agree that you can add any kind of accompaniments or extra nuts/veggies/cheese that you like! It’s a fun ingredient to play with.